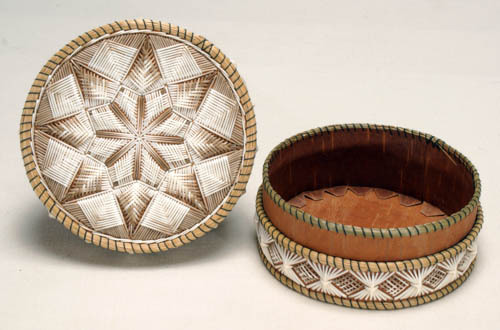 Round birch bark lidded box with dense white and brown quillwork, 8-pointed star on lid, diamonds on side. 1. 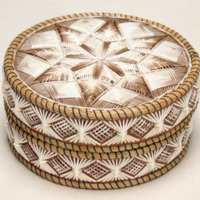 Form: This 5-inch diameter box is decorated with white and brown quills. In the center, they start as an 8-point asterisk, with points measuring just under an inch long. Around this, connecting at the points is an 8-point star. Each section of the star divided by the asterisk within is filled in with white (fading to brown) quills in a crosshatch pattern. This design is continued as the star is surrounded by another larger 8-point star, again filled in with the crosshatched quills. The segments outside of this largest star (between the points) contain a triangle of quills going one way, underneath a triangle of quills going the opposite direction. 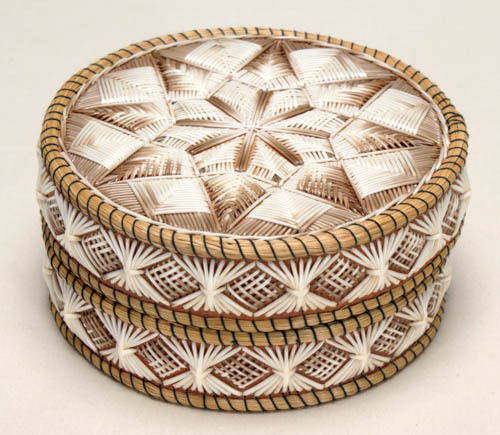 This entire design is outlined by a circle of quills, then a ring of sweet grass. Sweet grass lines the top and bottom of the lid, as well as top and bottom of the base and the top lip of the base inside. It is held in place by black thread. The side contains a repeating pattern in 2 rows (one on the lid, one on the base). Nine vertical quills are bunched together in the middle, fastened by a horizontal quill, and spread out at the ends. Between each of these is a diamond of crosshatched quills. The inside of the box has a bark lining, to hide the ends of the quills. 6. Condition: Very good. Small bits of sweet grass breaking off. The bottom on the inside is a little warped. 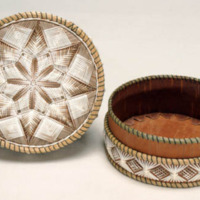 “Birch Bark Box,” Mathers Museum of World Cultures Digital Exhibits, accessed April 23, 2019, http://dlib.indiana.edu/omeka/mathers/items/show/237.